I came across this interesting read in THE HINDU on Friday and I thought I must share this. 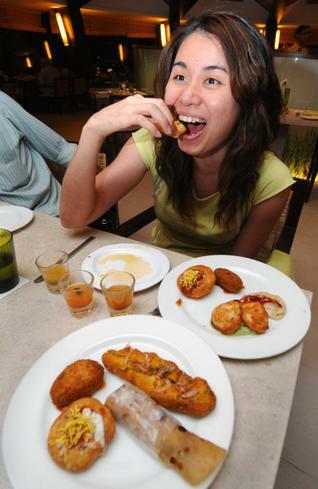 This is an article by Shalini Muthalaly who writes as the RELUCTANT GOURMET. You have a favourite restaurant, right? Of course you do. Ever recommended it to a friend, who hated it? Of course you have. It’s inevitable. People don’t always like the same things. Except for French fries. Over the years, you may have noticed that certain friends ask you for restaurant recommendations. And certain friends don’t. It’s got nothing to do with how much they like you. (Though I have to admit, my best friend’s aunt still holds me responsible for a bad meal she had in 1998. And I don’t think she’s liked me much ever since.) According to Erik Wolf, executive director of the World Food Travel Association, it’s got to do with food personalities. Everyday people are motivated to eat by anticipating different rewards. It comes down to what you define as a great meal. Contrary to popular perception, memorable dining is not just about the food. Listing your favourite food memories will give you an idea about your food personalities. For me, it includes fabulously authentic pizza at a warm, crowded, friendly café in Turin, a favourite with cab drivers. A hot chocolate breakfast at a bright London café. Dinner at a shack on the island of Koh Phangan in Thailand, with fluffy omelettes, thick cold coffee and a cook who hugged us hello and goodbye. A friend of mine chooses her recent chic Ibiza brunch of avocado sandwiches served in time to David Guetta beats. Another lists a five-course underground dinner in Kuala Lumpur, where the hostess served up seared salmon and tiramisu tarts. A third very well travelled friend surprises me by choosing lunch at the faded Mocambo restaurant in Calcutta. All this to explain why you do not always connect with your friends when it comes to food. It’s because people anticipate different rewards when you dine. Because all of us have different ‘PsychoCulinary’ profiles. The word, coined by the World Food Travel Association, has been used to break down people’s behaviour when it comes to defining a great meal. They conducted research on culinary travellers’ behaviour and motivation over 15 months, studying 11,000 respondents in 37 countries. The idea was to standardise 13 kinds of culinary travellers psychographic profiles. These are: adventurer, ambience, authentic, budget, eclectic, gourmet, innovative, localist, novice, organic, social, trendy and vegetarian. It’s not an exact science of course. Many of these overlap. Additionally, as most people will argue, food is all about variety. The same person who enjoys a five-course champagne and caviar breakfast may equally enjoy cheap beer and chicken satay at a grungy roadside stall. However, it’s an undeniably interesting way to analyse your food choices. Do it carefully, and you’ll find a pattern. Most consumers tend to exhibit up to three “foodie” profiles. Since this has been created by a food and travel association, the next obvious step was to devise personalities for cities. This was done by looking at the geographic residence of the respondents and their PsychoCulinary profiles. “We saw that there were large numbers of people with similar foodie profiles in the same cities. That’s how the idea of destination food personalities was born,” says Wolf. For example, New York is ‘gourmet, trendy and social.” San Francisco, not surprisingly, turned out to be localist, organic and innovative. Hong Kong turned out to be authentic, adventurer and gourmet, while Shangai was authentic, eclectic and trendy. Of course these are not iron-clad rules. A city, like a person, can be many different things. However, it does make it slightly easier to plan a holiday. And the next time that fussy friend of yours who only likes martini dinners whines about eating at your favourite hole-in-the-wall paratha place, you’ll be more understanding. She’s not being difficult. It’s just her PsychoCulinary profile.